We’re all human. We try to do our best at rose gardening, but sometimes . . . we know not what we do. If you are like me, you might learn the hard way and up inadvertently killing your lovely new roses. The Sin: Overcrowding. Roses need full sun and good airflow. If you plant them right on top of each other or too close to trees, fences, or buildings, your roses are much more likely to struggle with foliar diseases. This means your leaves will look less attractive, and your roses might even die. The Penance: Spread out. Move your roses to a nice sunny, open spot where they have room to breathe. You can also help fight any those foliar diseases with fertilizers and sprays that fight off fungus. The Sin: Overhead watering. Most plants are perfectly happy to get sprinkled with water from above. That’s how the sky does it, after all! Most sprinklers or watering cans deliver water this way. But roses are a special case. Several different types of fungus just love to eat rose leaves, and a lot of those fungi require moist conditions to thrive. If you constantly sprinkle your roses’ leaves with water, you are just asking for foliar diseases. The Penance: Proper irrigation. Water at the base of the plant instead, letting the water go straight to the roots. The good news is that roses have fairly deep roots, so if you water them deeply enough, they will be good for several days afterwards (Water Savers help, too). If you must overhead water, at least be sure to do it first thing in the morning so that the sun will evaporate the excess water quickly. The Sin: Overfertilizing. The common misconception is that more fertilizer=more blooms, but roses only need so much fertilizer, and adding too much synthetic fertilizer can kill natural soil bacteria and/or lead to salt burn, which can both harm your plant. A lot of the time a gardener will see yellow leaves or puny growth and think “that plant needs fed.” But then the plant looks even worse after a few days. So the gardener adds more fertilizer. By the time they realize what they are doing wrong, the plant is dead. Overfertlizing: just as lethal as eating a mountain of cheeseburgers. The Penance: A healthy diet. If you plant your rose in an organically rich soil with plenty of compost and natural, slow-release fertilizer, it should have all the nutrients it needs. Whenever bad spots pop up, first check to see if it has a pest or disease problem before you jump for the fertilizer. Think about it this way: when your kid gets sick, you take them to a doctor, not an all-you-can-eat buffet. The Sin: Spreading disease. Foliar disease is rose enemy number one. When you prune your roses, any diseased leaves at the base of the plant can keep re-introducing foliar disease. Even composted leaves can harbor disease. This problem gets exacerbated if you use a dull, dirty blade that tends to crush canes and spread disease. Now my feet are dirty. Great. The Penance: Cleanliness. When you prune your roses, be sure to dispose of any leaves that look diseased. It is also wise to check around the base of the plant and pick up any leaves that have fallen. To be extra careful, I try to keep the ground under my roses clear of all leaves in case there is disease I just haven’t noticed. I also make sure that I’m using a good, sharp pair of shears and that I wipe down the blades with alcohol between plants to prevent the spread of disease. The Sin: Pruning incorrectly. A lot of us are afraid to prune our roses at first, which can lead to asymmetrical, overcrowded roses that breed foliar disease. Some of us go the opposite way and get overzealous, cutting too far down. The Penance: Pruning Correctly. Remember that you want to reduce your cane’s height by a third or half, at the most. When pruning be sure to remove any dead or diseased wood, to keep the center of the plant clear (for air flow), and to remove all thin, weak canes that just sap energy from the productive canes. If your rose is grafted, also look out for any canes growing up from below the graft and prune them out or they will sap all the energy from your beautiful plant. See this blog post for more details. The Sin: Killing ALL the bugs. When we spend so much care and effort nurturing beautiful roses only to see them ravaged by aphids, mites, or Japanese beetles, we might fly off the handle. We can get trigger-happy with the insecticide spray until all those pests have been expunged. But the cost of our wrath, unfortunately, is often the collateral damage that we do to the beneficial bugs that we actually WANT around, like the ladybugs and praying mantises that eat pests or the bees and butterflies that pollinate your flowers. Remember: bees are your buddies. The Penance: Organic controls. Hand-pick pests as much as you can, and encourage predatory bugs to take up residence in your garden and help you out with pest-patrol duty. If you still have series pest problems, try using formulas with Neem Oil that smother the little pests without poisoning your larger beneficial buddies. The Sin: Impatience. The first time my roses bloom, I enjoyed them for a week or so, then I wondered “Is that it? They aren’t blooming anymore. How long do I have to wait! ?” Well, of course they stopped blooming, because I didn’t deadhead them! A rose’s purpose is to get pollinated and set rose hips. If it achieves that goal, it will put all its energy into rose hips and it will have no need to set more flowers. The Penance: Deadheading. If you want to keep your rose blooming longer, you really have to snip the spent blooms so your rose will keep trying to pollinate. No, this is not hurting your rose. In fact, it helps to prevent disease. There are plenty of reasons to deadhead: here are some more. Now, who’s guilty of at least one of these? Me too. But remember, to err is human, to forgive is divine. 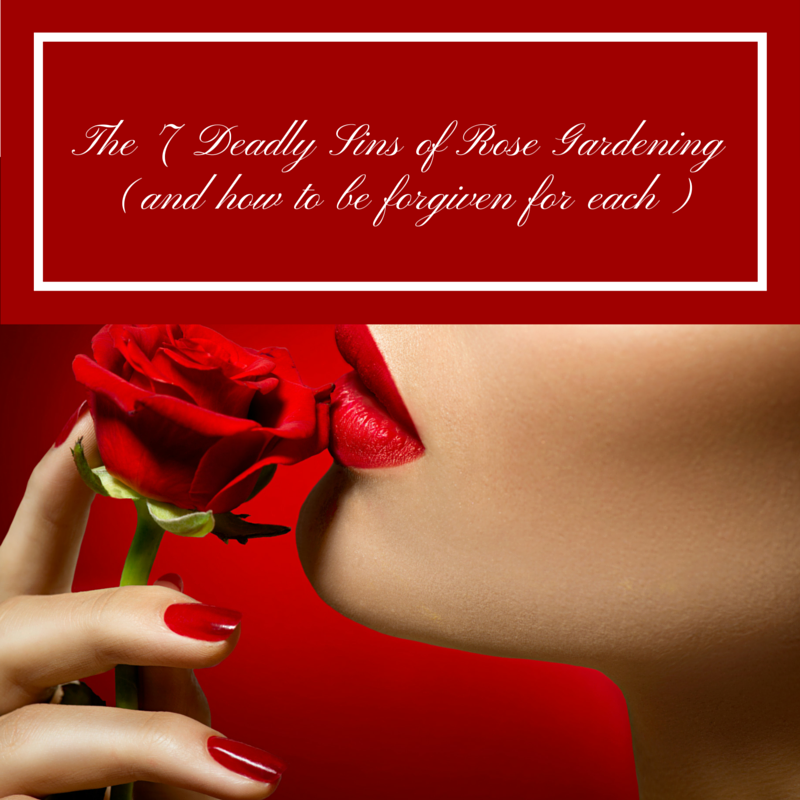 If you’re guilty of any of these sins, you can still repent and (hopefully) your roses will forgive you. Uh oh. This spring I threw a handful of Osmocote on each of my rose bushes. We had a month of rain in May (DC area). I haven’t got any blooms and looks like the deer got much of the new growth. Very bad spring this year.